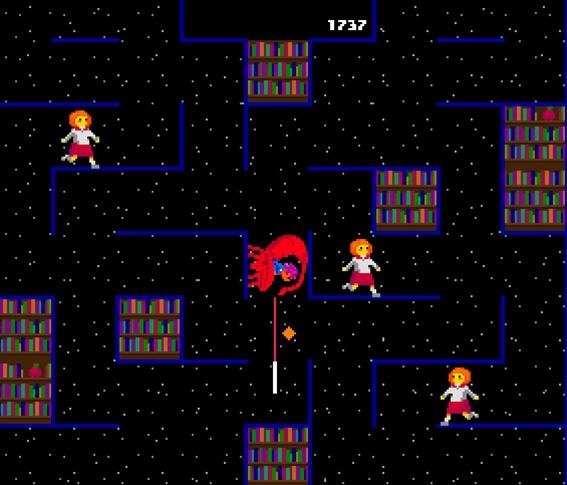 Most of the oddest games in the world are free web games. They may not always be well made, but low budgets (and consequently low risk) allow them to be as weird as they fancy. That's a big part of why they are so interesting. Prime examples such as Don't Take It Personally, Babe, It Just Ain't Your Story and Lesbian Spider Queens of Mars have graced these pages previously, and both are great games. But the quality of the games hasn't stopped mysterious Glorious Trainwrecks user snapman (elsewhere identified as emma entropy) from creating an amazing spoof mashup combining the two, entitled Scorpion Psychiatrists Of Saturn. 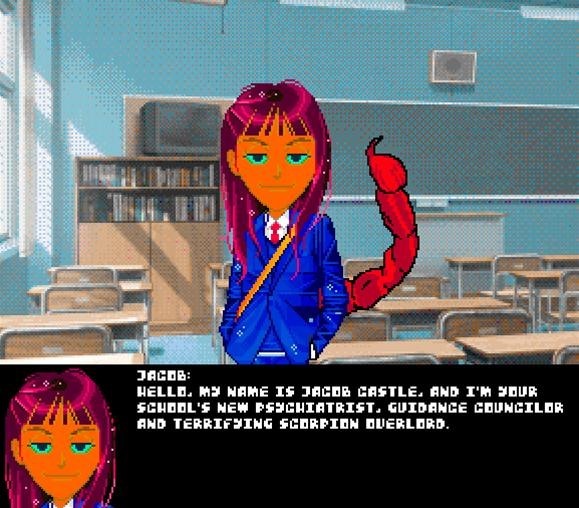 A quick refresher: DTIPBIJAYS (Don't Take It Personally, Babe, It Just Ain't Your Story) is a visual novel where the player controls a purple-haired high school teacher who spies on his overly dramatic students. LSQOM (Lesbian Spider Queens of Mars) is an Adult Swim game casting the player as a—you guessed it—lesbian spider queen from Mars who must capture her escaped slaves in the context on an old-timey action arcade game, such as Joust. Both games are about as eccentric as indie games can be, and for unexplained reasons, snapman/emma entropy decided it would be funny to combine them. They were right. Scorpion Psychiatrist From Mars is a parodic mashup of the two games. It switches between LSQOM-style levels where the scorpion psychiatrist protagonist must round up his erstwhile students, and DTIPBIJAYS interludes where the same psychiatrist talks to his class of students, each of whom resembles one of the seven students from the original game. Their dialogue is hilarious and rips DTIPBIJAYS' characterizations to shreds. "oh my god, what did I do to deserve this? it's not even my birthday or anything! (ExciteMike's version worked fine for me, right through the ending.)" If the creator of something that's been spoofed not only finished but liked the spoof of their creation, that usually bodes well for it. SPOS might not be a very "good" game. The LSQOM levels feature enemies that sometimes move so fast they are nearly impossible to catch, which makes the game drag on at times. It is short though, at about 20 minutes, and funny enough that anyone who has played the two original games should enjoy this little gem.